One of the most incredibly designed creatures in the world is the pangolin of Asia and Africa. Because they are rarely seen in zoos, many people don’t know what they are. Because some nations view their scales as medicinal, pangolins have been hunted heavily and are now some of the rarer species of animals in the world. There are eight species of pangolin in the world. Four are found in Asia, and four in Africa. The pangolin is the only mammal in the world covered in scales. It does have some hair, and some species have tiny stiff hairs sprouting between the scales. The scales are made of the same material as the hair, though very different in structure and very tough, as an adult. When curled into a ball, even lions struggle to harm adult pangolins. The pangolin also has the ability to put out a foul odor when threatened. Male pangolins weigh a lot more than females: sometimes as much as 40% more. They do not usually live together, except during mating season. They are mostly nocturnal, with poor vision. Pangolins eat ants and termites. They catch prey using their tongue, which has a specialized glue-like substance on it. The pangolin inserts its tongue into an ant hill or termite mound and its tongue sticks to insects, drawing them out of the hole into the pangolin’s mouth. A pangolin can eat over seven ounces of insects a day. Since the pangolin has no teeth, it uses stones that it swallows to crush its prey in its stomach. They have tough digging claws, designed to dig into dirt and rip open insect burrows. Their strong sense of smell enables them to find their prey. Depending on the species, females will give birth to one to three young, which are born with soft scales, rather than the hard ones adults have. Because of this, baby pangolins are vulnerable to predators. However, a mother pangolin will roll herself around her baby when threatened, effectively protecting it from any predators. When the mother goes for a walk, the young pangolin clings to her tail, riding along as she moves. It takes two years for the young to be self-sustaining, though they are weaned onto insects around three months. 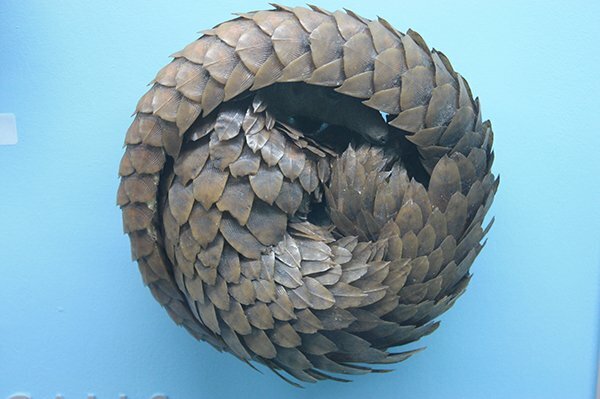 The pangolin is clearly designed. Their tongue is attached deep in the chest cavity rather than at the back of the mouth, and is coated with a sticky saliva which causes insect prey to be trapped on it. This raises problems for the evolutionist, who cannot explain how pangolins evolved. Anteaters and woodpeckers use a similar mechanism but are considered evolutionarily unrelated, so the sticky tongue would have had to evolve separately on at least two other occasions. What mindless chance process produced a tongue that was sticky, but was somehow smart enough to realize that it would be unusable if it were stuck to the roof of its mouth? To do what a pangolin does requires a specialized set of tools. We know this because we see the same set of tools on anteaters which live a similar lifestyle. The pangolin comes with all the needed equipment. It has strong digging muscles, sharp claws, a sticky tongue, and an incredibly strong sense of smell. All four of those are needed for the pangolin to survive. They could not have evolved gradually over long periods of time.